The University of Queensland and the Australian Research Council Centre for Excellence in Environmental Decisions study examined how to best benefit coastal marine ecosystems on limited conservation budgets, to help managers better understand the trade-offs. 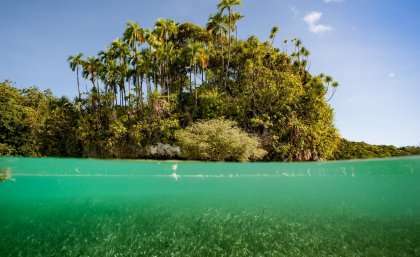 UQ Development Fellow Dr Megan Saunders said the researchers developed a model comparing scenarios of restoration versus protection, on land, or in the sea, for coastal marine ecosystems. "Coastal ecosystems like seagrass, coral and mangroves occupy the narrow fringe of sea between the land and the deep ocean," Dr Saunders said. "As such they provide easy access to the marine world – they are shallow, close to shore, and relatively calm places compared to the open ocean. "These same features also make coastal ecosystems vulnerable to human activities – activities occurring both on land and in the ocean. Consequently, these ecosystems pose a number of challenges to managers." Dr Saunders said conventional wisdom was that the most effective conservation actions to benefit coastal marine ecosystems involved implementing marine protected areas, or alternatively reducing land-based threats. "Active marine restoration, on the other hand, is typically considered a low priority option," she said. "This is due in part, to high costs and low success rates. "However, our model, based on seagrass meadows and adjacent catchments in Southeast Queensland, found that contrary to conventional wisdom, and despite high costs, marine restoration may be the most cost-effective way over decades to maximise the extent of marine ecosystems under particular circumstances. "This assumes that there is suitable habitat available for restoration (such as planting seagrass transplants); clearly, if suitable habitat does not exist, for example due to poor water quality, then other actions would take priority." Dr Saunders said the researchers had developed some simple rules to guide decision making for whether restoration or protection should occur in either marine or terrestrial environments to best benefit marine ecosystems. "These rules-of-thumb illustrate how cost-effective conservation outcomes for connected land-ocean systems can proceed without complex modelling," she said. The paper, Simple rules can guide whether land or ocean based conservation will best benefit marine ecosystems, is published in PLoS Biology.